With the Nerds Box Couples Costume celebrate Halloween with your favorite dork! Why be nerds alone when you can be nerds together? In this Nerds costume package, you and your partner literally complete each other. You'll have good taste when you wear these Nerds outfits. 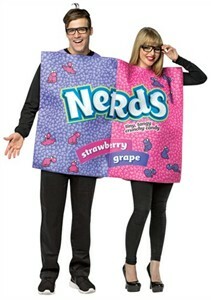 The Nerds couples costume comes with two Nerds tunics that make a double flavored Nerds box. Also includes 'nerd' glasses to bring the Nerds look to life. Make this Halloween extra sweet with a deliciously cute couples costume! Availability: The Nerds Couples Costume ships in approximately 1 business day.